to the members of the Association Française de Strabologie interested in Posture. The perception of space is not built independently on each sensitivo-sensory canal. This very old hypothesis, that Aristotle already proposed in his Peri Psuches, has been studied for the perception of visual space that is built from retinal afferences and proprioceptive oculomotor afferences (Blakemore et al., 1975; Cynader et al., 1975; Cynader et al., 1976; Hein et al., 1979; Hein et al., 1987). In order to check that this hypothesis is also true concerning visual and vestibular afferences, we could take into account the very particular anatomy and the physiology of the semi-circular canals. Each canal, indeed, specifically perceives angular accelerations depending on the plane, the way and the direction of the acceleration relatively to the plane of that canal (Ross, 1936; Löwenstein & Sand, 1940; Adrian, 1943; Zotterman, 1943; Estes et al., 1975; Banks et al., 1975.a). Thus, an angular acceleration parallel to the plane of the right posterior canal and going backwards and right will involve the appearance of stimulating afferences only from the cupula of that canal (fig. 1). Now, in the absence of movements of the eyeballs, the head movements provoked by those angular accelerations are accompanied on the retina by a shift of the environment image along an ocular meridian parallel to the vector of that angular acceleration. If, during the ontogenesis, the perception of space is not built independently for the visual canal and for the vestibular canal, signs of this privileged relation between the planes of the semi-circular canals and the directions of the visual space have to be found. FIG. 1 - An angular acceleration in the plane of the right posterior canal (CPD) involves a movement of the stimulating endolymph only in the right posterior canal. If the eyeball is motionless, the movement induced by this acceleration is accompanied by a retinal shift along an ocular meridian parallel to the plane of the right posterior canal, in the way and direction of the acceleration. Approximately knowing the planes of the semi-circular canals, it is possible to determine geometrically those ocular meridians «corresponding» to the planes of the semi-circular canals. The plane of the left posterior canal, for instance, makes an angle of around 71° relatively to the horizontal plane of the stereotaxic system of Reid (q1 on figure 2) and an angle of around 55° relatively to the sagittal plane of the same system (q2 on figure 2) (Blanks et al., 1975.b). The section of the eyeball by a plane parallel to the plane of that canal and going through the centre of the eyeball, corresponds to the meridian along which the environment image shifts during movements with accelerations stimulating the left posterior canal.
. We can notice that the same retinal shift is provoked by a rotation of the eyeball around an axis perpendicular to that plane. FIG. 2 - Descriptive study of the section of an eyeball by a plane parallel to the plane of the left posterior canal and going through the centre of the eye. That last remark points to a privileged relation between each semi-circular canal and one or several oculomotor muscles that, when close to the primary position, provoke a rotation around an axis perpendicular to their plane. That privileged relation has actually already been described by various authors (Lorente de No, 1932; Szentagothai, 1950; Cohen et al., 1964; Ito et al., 1976).
. A prism deviates the visual space in a single direction that can be identified thanks to the position of the base of the prism. If, during the ontogenesis, the perception of space has been built coherently for the visual and the vestibular sensory canals, certain relation between the planes of the canals and the position of the base of the prism has to be found. For instance, a prism with a base situated at 125° provokes on the retina a deviation of the visual space approximately parallel to the retinal meridian «associated» to the plane of the right posterior canal (fig. 3). FIG. 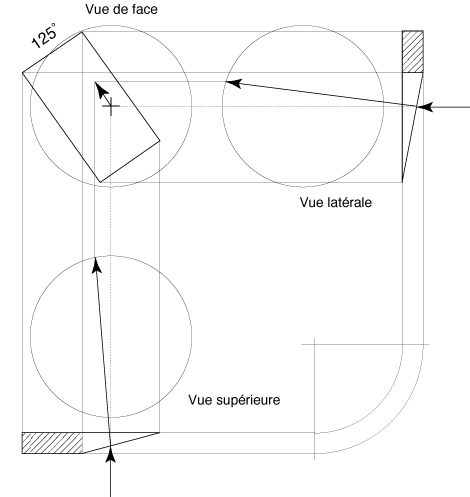 3 - Descriptive study of the deviation of the visual space by a prism with a base situated at 125°. The deviation of the visual space is approximately parallel to the retinal meridian "associated" to the right posterior semi-circular canal.
. The apparent movement of the environment image on the retina of the right eye corresponds to the movement of the eyeball, close to the primary position, produced by the action of the obliquus inferior muscle.
. In order to check that this relation between the planes of the canals and the position of the base of the prism can be found again experimentally, a retrospective study has been undertaken on the files of postural patients of the Institut de Posturologie treated by the wearing of optical prisms.
. Since the publications of Magnus (1924), we know, indeed, that the perception of space intervenes in the regulation of the tonus of posture. It is therefore possible to propose a study, via postural tonus, of phenomena intervening in the perception of space.
. The files of 197 patients who had been attended at the Institut de Posturologie for symptoms related to functional disorders of the control of the orthostatic posture, have been selected because they contained precise reports of normalised postural clinical examinations (Gagey, 1993) all those patients had undergone. Those files notably contained numbered evaluations of postural tonus, with and without an optical prism of which the position of the base was known.
. Those patients either complained of vertigo sensations and/or instability, without anomalies in the vestibular functional tests, or of various pains in the corporal axis in orthostatism (lumbar pains, cervical pains, etc.).
. The numbered evaluation of postural tonus selected for this study is the spin movement observed during the stepping test of Fukuda-Unterberger (Fukuda, 1959). That spin parameter has been studied in a population of normal subjects; we know the distribution of its random fluctuations between two tests performed in similar conditions at a few minutes or a few weeks interval: the mean of matching differences between two similar tests is of 0° ± 25° (Weber et al., 1984). The performance conditions of the stepping test described by Gagey & Weber (1995) have been respected in the population of patients studied. We know that changes in the symmetry of postural tonus involve systematic changes in the spin movement during the stepping test (Fukuda, 1959; Ushio et al., 1976).
. In accordance with what was demonstrated in the introduction, the studied positions of the base of the prism are - written in the trigonometrical order from a left temporal [or right nasal] position: 0°, 55°, 125°, 180°, 235°, 305°.
. All the subjects of this study have performed a stepping test without prism and a stepping test with prism in at least one of those positions of the base of the prism. No subject has repeated the stepping test for all the positions of the base of the prism. The position of the base of the prism studied in a given subject has been determined by the other tests of his postural clinical examination that showed the possibility to modify the postural tonus of that subject thanks to a prism of three prismatic dioptres put in that position.
. The distribution of the changes in the spin movement provoked by the wearing of the prism is very significantly different from the distribution of the random changes of that same movement (p<0.001), whatever the position of the base of the prism (Fig. 4).
. The way the spin movement changes depends on the position of the base of the prism (fig. 4): sometimes, under the effect of the prism, the subject turns more to his right when the base of the prism is put at 0° or 125° or 235° (negative values of the spins difference with and without prism), sometimes he turns more to his left when the base of the prism is put at 55° or 180° or 305° (positive values of the spins difference with and without prism). FIG. 4 - Spin changes observed according to the different positions of the base of the prism. At the centre: diagram showing the different studied positions of the base of the prism put before the patient's eye (either left or right). On the sides, for each of the six positions of the base of the prism, histogram of the change in the spin movement provoked by the placing of the prism. Curve of Gauss reminding the normal theoretical distribution of the random changes of the spin movement.
. The bearing of this statistical analysis is limited. It only concerns subjects who showed functional disorders related to the orthostatic posture. However, a similar study has been carried out on normal subjects (Ushio et al., 1980), but it only concerned positions 0° and 180° of the base of the prism and it was done on a small number of subjects only. 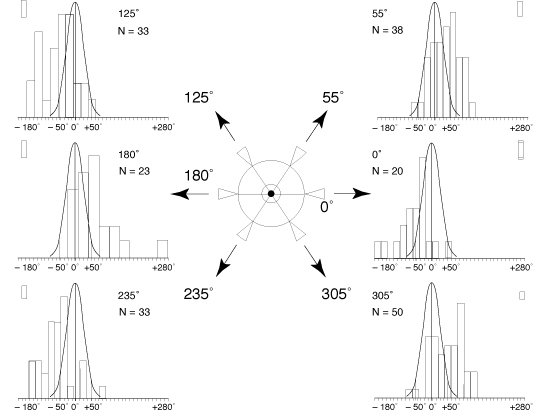 Yet the results of the study of Ushio and colleagues agree with the present analysis.
. Each subject has only been studied in one position of the base of the prism; the described differences between all the positions of the base of the prism could therefore be seen as interindividual differences. However a study, close to the works presented in this article, has been done on normal subjects with turning prisms that, in eight seconds, explored in the same subject all possible positions of the base of the prism (Séverac et al., 1993). Now, the results of Séverac and colleagues also show a difference of direction of the postural answer according to the position of the base of the prism. The agreement of the results of Séverac and colleagues with the present study ends here because the differences between the protocols do not allow a more precise conclusion.
. The reported clinical facts do not allow proving that the perception of space, during the ontogenesis, is organised in a coherent way between the visual and vestibular sensory canals, yet they certainly make that hypothesis even more probable. Adrian E.D. (1943) Discharges from vestibular receptors in the cat. J. Physiol. (London), 101, 389-407. Blanks R.H.I., Estes M.S., Markham C.H. (1975.a) Physiologic caracteristics of vestibular first-order canal neurons in Cat. II. Response to constant angular acceleration. J. Neurophysiol., 38, 1250-68. Blanks R.H.I., Curthoys I.S., Markam C.H. (1975.b) Planar relationships of the semicircular canals in man. Acta Otolaryngol. (Stockh. ), 80, 191-200. Cohen B., Suzuki J., Shanzer S., Bender M.B. 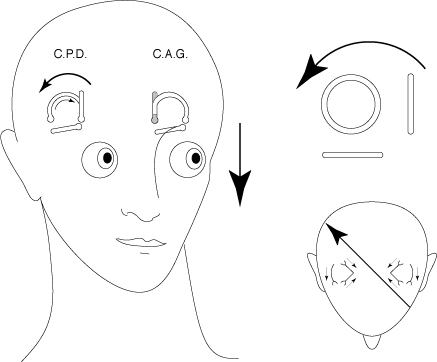 (1964) Semi-circular control of eye movements. In: M.B. Bender (Ed.) The oculomotor system. Harper & Row, New York. Estes M.S., Blanks R.H.I., Markham C.H. (1975) Physiologic caracteristics of vestibular first-order canal neurons in Cat. I. Response plane determination and resting discharge characteristics. J. Neurophysiol., 38, 1232-49. Gagey P.M. (1993) Le bilan postural. Ann. Kinésithér., 20, 295-301. Hein A (1987) La structuration de l'espace visuel peut-elle se développer en l'absence des informations proprioceptives oculomotrices? Critique de la Posturologie, 12, 1-4. Ito M., Nisimaru N., Yamamoto M. (1976) Pathways for the vestibulo-ocular reflex excitation arising from semicircular canals of rabbits. Exp. Brain Res., 24, 257-271. Lorente de Nò R. (1932) The regulation of eye positions and movements induced by labyrinth. Laryngoscope, 42, 233-332. Löwenstein O. & Sand A. (1940) The individual and integrated activity of the semicircular canals of the elasmobranch labyrinth. J. Physiol. (London), 99, 89-101. Ross D.A. (1936) Electrical studies on the frog's labyrinth. J. Physiol. (London), 86, 117-46. Szentágothaì J. (1950) The elementary vestibulo-ocular reflex arc. J. Neurophysiol., 13, 395-407. Ushio N., Hinoki M., Baron J.B., Gagey P.M., Meyer J. (1976) The stepping test with neck torsion: proposal of a new equilibrium test for cervical vertigo. Practica Otologica Kyoto, 69, Sup.3, 1369-79 (En japonais). Ushio N., Hinoki M., Nakanishi K., Baron J.B. (1980) Rôle of oculomotor proprioception in the maintenance of body equilibrium; correlation with the cervical one. Agressologie, 21, E, 143-52. Weber B., Gagey P.M., Noto R. (1984) La répétition de l'épreuve modifie-t'elle l'exécution du test de Fukuda? Agressologie, 25, 1311-14. Zotterman Y. (1943) The microphonic effect of teleost labyrinth and its biological significance. J. Physiol. (London), 102, 313-8.